Christmas is just around the corner, so it’s time to turn our attention to family, food and fun. While we dust off our best Christmas jumpers. Our dogs may be secretly dreading our desire to get them dressed up for the festive season. Although some dogs don’t object to a cosy jumper or even a full Santa suit, There are others who prefer a more subtle approach to joining in with the holiday spirit. Sometimes less is more when it comes to dressing your dog for the season. So if your dog is more furry Grinch than party animal. Here is an excellent selection of Holiday dog collars that will impart some festive cheer without making your dog uncomfortable. With fourteen designs to choose from these collars from Blueberry Pet are sure to make your dog the best dressed pup at the party. The bow tie makes the collar extra special but isn’t too large to make it uncomfortable for your dog to wear. VIBRANT COLORS: Your dog only gets one piece of clothing so make it count. We select the most unique patterns to make your dog beautiful. If you’re after something a bit more subtle. Then these Holiday dog collars from Native Pup are perfect. With four beautiful designs and three sizes. 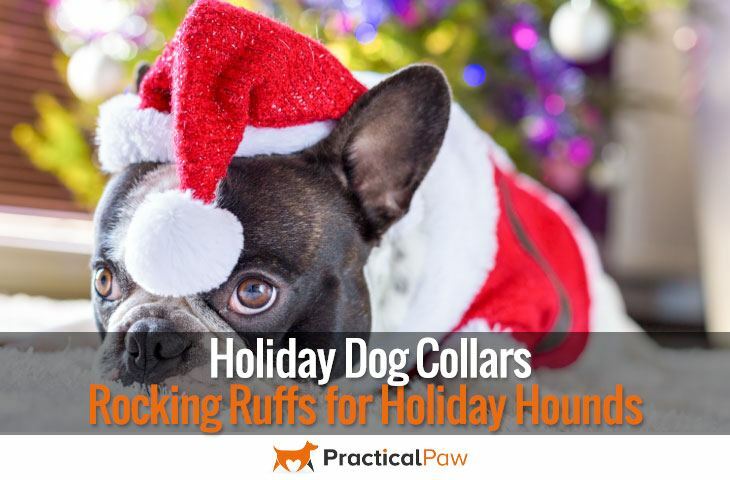 They will fit most dogs and provide a bit of festive cheer without your dog even noticing that they’re embracing the holiday spirit. With so many designs to choose from, You may find it difficult to choose just one. Styled as a standard collar these collars are machine washable and weather resistant. Produced with comfort in mind there’s a design to suit every occasion. We love this scarf from Zippypaws. Guaranteed to make your dog the centre of attention. It’s easy to slip on and off. What’s more, it’s lightweight, keeps your dog warm and has a simple slip closure. If your dog is happy wearing a bandana then this is ideal. What could be more festive than a Santa inspired accessory? Made from a soft plush fabric so as not to irritate your dog. It has a Velcro fastening that is easy to adjust. Great for holiday photos and family get-togethers. Size: S, minimum neck girth is 10", the collar is adjustable with elastic band. Material: This collar is made of high quality velour material, soft to touch. If your dog doesn’t mind a bit of bling (and a few bells) then this collar for you. Made with soft velour material it’s bound to add a bit of festive cheer to your dog’s day. Eight jingle bells complete the look and will guarantee that you’ll know where your dog is all day! Tail Trends have a lovely selection of pure cotton doggy bandanas. With each design appliquéd onto the front. These pretty scarfs make any dog look festive, and they are soft enough to wear all day. Christmas is a time for family, and that includes our dogs. So keep them comfortable and safe over the holiday season and indulge in the less is more approach to dressing your dog up for Christmas. For further reading, see our article on Christmas trees.